Last fall, I had the good fortune of being welcomed into Rachel Scupp’s 8th grade IRLA (Integrated Reading Language Arts) classes. Earlier in the summer, I had mentioned to Rachel that I wanted to develop LGBTQ middle grade curriculum — to which she immediately replied, “Why not my classes? We teach a social justice curriculum!” And we were off. After speaking with Rachel’s enthusiastic supervisor and getting permission from her equally supportive superintendent and school board, we decided to schedule the LGBTQ Book Club unit we had designed in October. We used this unit to introduce Rachel’s students to one of the close-reading lenses they would apply to the different texts they read throughout the year. 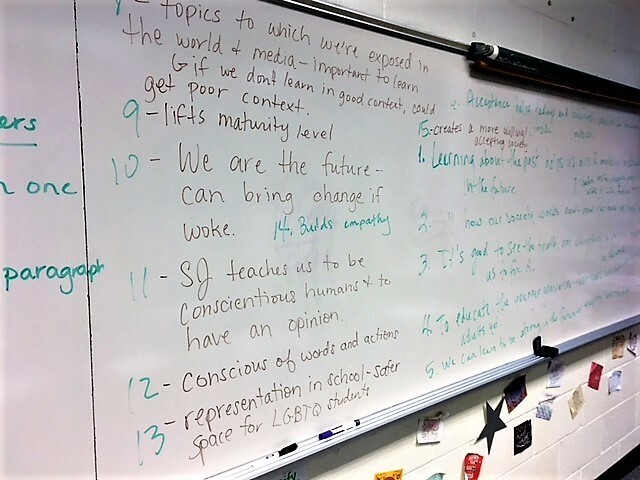 Our specific focus/lens was heteronormativity, but since then, Rachel’s students have also extensively talked, researched, and read about human rights, power and privilege, social justice character archetypes, and prejudice as racism, classism, sexism, colorism, and ableism. All of this reading and thinking ultimately culminated in a study of world genocides. In the LGBTQ Book Club unit, Rachel’s students chose from Gracefully Grayson, Lily & Dunkin, Felix YZ, So Hard To Say, Star-Crossed, and The Misfits (they requested we include a nonfiction title next year). During their Social Justice Book Club unit, their options were I Am Malala, Monster, Sold, Speak, and The Skin I’m In (and next year: All American Boys). When they arrived at the World Genocide unit, they selected from Alive in the Killing Fields, Between Shades of Grey, Children of the River, Forgotten Fire, Over a Thousand Hills I Walk with You, The Book Thief, The Boy in the Striped Pajamas, and Zlata’s Diary. Other novels they read and discussed as a class were The Outsiders and To Kill A Mockingbird. With the end of the year quickly approaching, we asked Rachel’s students why reading and discussing these books was important to them. Here, in their own words (we promise! #TheseAreSmartKids), are their thoughts. (1) Educate us and help us become more accepting, which is the building block for equal representation and friendships. Adults’ perceptions on the world around them have been influenced by social constraints and stereotypes that they tend to follow the mainstream ideas in society in order to fit in. Children and teenagers have not been influenced by the perceptions of society yet. They still have the chance to be molded into people with more flexibility and who are more willing to accept change in their society. Nothing is more important than educating the young since they become the future. (2) Teach us about these topics in a good context so that we get the whole truth. Learning in a safe space allows you to develop your own opinion and not be influenced by the media. If positive viewpoints are inflicted upon us at a young age, we will grow up to be more accepting. Understanding the world around you is critical and in order to do so, students need to be exposed to correct information. This information can include social injustices and the current events that connect to them. It is extremely important to know the whole truth, which means the events that have taken place as well as the mistakes that were made. (3) Inform us about the past so we can understand how our society works now as well as how to avoid making mistakes in the future by being conscious of our words and actions. We cannot forget the past because if we do, we will not be able to understand how society works in the present, and so understanding will help us move forward. Being strong and understanding as a kid will allow you to be even stronger and more understanding as an adult. As we learn about different types of people, we are able to have difficult conversations and empathize with them. The book clubs and similar class discussions allowed us to realize that prejudice is caused by a lack of empathy. (4) Teach us to be strong in the future by being accepting and understanding. The more we learn about and accept the LGBTQ++ family, the stronger and more woke we will be in our lives. It’s important to learn new things in our life because our childhood and our understanding of the world is dependent on who we are, what we do, and what we become in the future. It’s okay to change who we used to be in order to help the next generation. We are the future and we are ready to bring change, to be more accepting, and to be more understanding. (5) Create a safe space for LGBTQ members in society and in schools. We must learn to respect LGBTQ people by using proper terminologies in order to give them a sense of belonging. We must abide by others’ right to express themselves by not generalizing the infinitely many experiences to merely a few broad generalities. We also got the chance to create an LGBTQ advocacy project which led to the creation of the GSA, our first Gay-Straight Alliance at Grover Middle School. (6) Make us conscious of how LGBTQ kids are represented in books. These books gave us more perspectives and insight into the lives of LGBTQ kids. We learned about the daily struggle of certain LGBTQ students and how we can overcome the struggles as a community, together. Through books we can learn the truth–that everyone is equal no matter who they love, or what they look like. The way we can learn about acceptance is by reading LGBTQ+ and social justice books. These books can teach us to build friendships with anyone and will allow us to become more accepting. Through these books, we can see equal representation of all people and we can spread equality, which could ripple throughout many generations. (7) Prevent us from making mistakes in the future in order to bring change, become stronger, and be more mature. Our maturity levels depend on who we are, what we do, and what we become in the future. Our acceptance is based on what we do in our school and in our childhood, so shouldn’t we change it for the better? Because we are the future and we need to change. Most people say that you should always learn from your mistakes, and that’s what we, as a society, have to accomplish. When educated on these topics, we learn to accept others and become more mature. (8) Inspire us to love reading…full disclosure, Rachel and I wrote this, but we think her students wouldn’t mind and would agree. They were deeply invested in each unit, they constantly shared titles and texts with each other, and every time I visited Rachel’s class throughout the year, at least two of her students made a point of telling me what new LGBTQ titles they’d discovered, for example, Rick Riordan’s Magnus Chase (series), and most recently: Simon Vs. The Homosapiens Agenda and Openly Straight. We can’t wait to get started again next year! Emily Meixner is an Associate Professor of English at The College of New Jersey in Ewing, NJ, where she teaches courses on secondary ELA pedagogy and young adult literature. She is currently reading The Summer of Jordi Perez by Amy Spalding. You can follow her and hear more about what’s she’s reading, watching, and teaching on Twitter @EsMteach. Rachel Scupp is an 8th grade IRLA teacher at Thomas R. Grover Middle School in West Windsor, NJ. She has two awesome dogs–Emerson and Moose–loves to adventure, and teaches a social justice and human rights curriculum through literature. She is currently reading Rebound by Kwame Alexander. You can follow her on Twitter @RachelScupp. Rachel’s 8th grade students are GRADUATING and will be attending high school in the fall. Watch out! how wonderful for everyone ! I had the privilege of sitting in on Emily’s and Rachel’s NerdCampNJ session in which they discussed some of their techniques and approaches to these texts (including Star-Crossed). They are both gifted educators—and a gift to education. If you ever have a chance to connect with them, take it! Awesome! As a proud member of Grover’s past, I am excited for its future! Thank you, Rachel and Emily, for having the courage and tenacity to bring this to our students! A needed curriculum for all students. I love these books, these themes, and these learning objectives. Where can I find our more information about thelesrnkng activities that our done in class to support these novel studies? So important to have these discussions these days. Really appreciate this undertaking. You are a fabulous soul. Keep blogging! Inspirational – thank you for sharing this! “Learning in a safe space.” says it all. Thank you.